There are only a handful of production groups as reliable and organized as Global Dance that would be capable of planning a synchronized event, which is taking place in three different locations. Starting things off: Global Dance joins forces with AEG Live and Live Nation to bring a 2-day event to its hub in Colorado on December 30 & 31 at the Colorado Convention Center. An all-star 20-man lineup has been announced with DJ sets from Deadmau5, Jack Ü (Skrillex & Diplo), and Bassnectar. Additional talent in support of the headlining acts at this flagship Decadence event can be seen below. 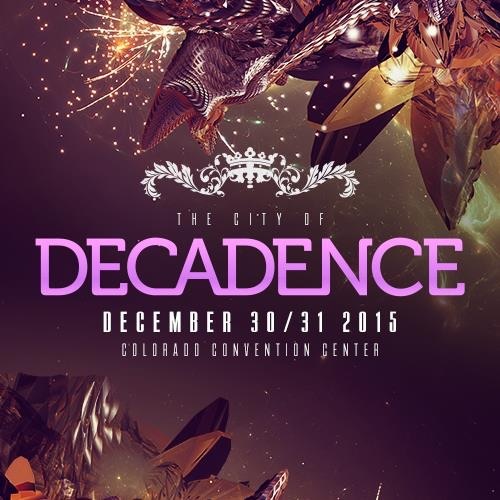 If you’re in the Southwest USA or prefer a little bit of a warmer celebration, then give Decadence Arizona a look. Returning for the second year in a row with the help of Relentless Beats, it’s sure to be even bigger and more spectacular than the last. Knife Party was just recently announced to join the likes of Pretty Lights and Adventure Club, with more headliners to be unleashed in the near future. Decadence doesn’t stop there! They are going for the trifecta of NYE events and have one last final party planned for Salt Lake City on the 31st of December alongside V2 Presents. Details for this event are still being held tightly under wraps. You can guarantee if it carries the name of ‘Decadence’ it won’t be cutting any corners to give partygoers an unforgettable New Years experience. Check out the website here for details and ticket/hotel information.